Dianne created these figures herself. If you need help with figure-drawing the Good News Bible is a great source. Permission to copy will be freely given. See address at very beginning of this book. These pictures are three of a set of twelve and show the Lord beside us at different stages and times of our lives. Pictures leave us free to receive from the Lord what He wants to say to us. 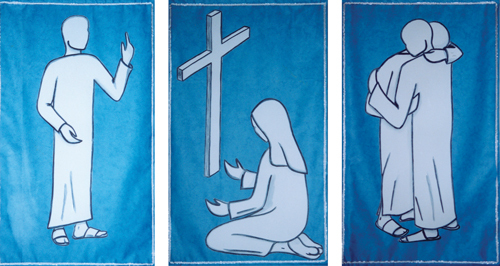 The background colour is blue as these banners were made for our Lady Chapel and the material is P.V.C. tablecloth fabric. I first drew the figures rough on A4 paper and enlarged them on a photocopier to heavy duty cartridge paper. The figures were outlined in a thick indigo Aquarelle stick – Faber-Castel – and attached with Blutak.